Andrew Artt was the son of Andrew and Maria Artt. His mother, Maria Artt, died just a year old. The family lived in the Cloghog area. Andrew was an engine cleaner. Sapper Andrew Artt served with the Royal Engineers in World War One and was wounded in action. After the war, Andrew Artt worked as a locomotive fireman, an assistant to the engine driver. He worked on the rail line that ran between Cookstown and Coleraine. 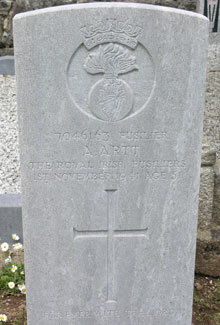 Fusilier Andrew Artt was serving with the 5th Battalion of the Royal Irish Fusiliers when died at home on 1st November 1941, aged 51, of tuberculosis.